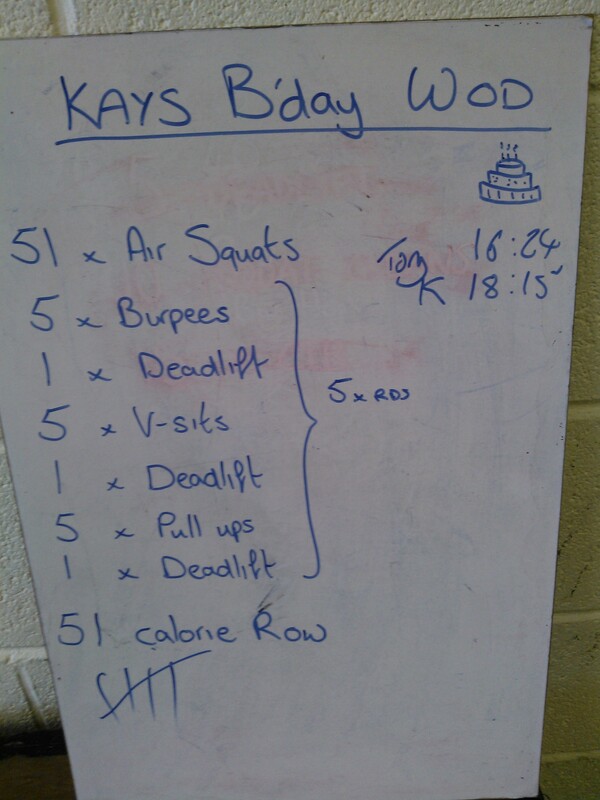 There’s something peculiar about birthday WODs – one the one hand they’re a privilege and on the other hand … they’re horrible. My birthday was 6th September but I couldn’t WOD until today,9th. OH kindly volunteered to join in the ‘fun’. And what did this fun consist of? With the middle section (the bit I’ve bulleted) repeating 5 times. So … on the good side, with the 18 burpees we did in the warm up, this made up all our burpees for today (today is day 40 of the 100 day burpee challenge). On the not-good side, a 51 calorie row at the end of a WOD is an atrocious way to celebrate a birthday! Times as on the board, but while I lifted 65 kilos (I weigh 52k), OH lifted 80 kilos and he weighs 75, which may contribute to some of the difference in our times. And actually, it was fun. Thanks Coach David for the programming! Posted in Crossfit, Lifting, pull ups, Rowing, Why I do Crossfit, WOD. Bookmark the permalink. The focus today was pull ups and ring dips – both strict. I had to use a red band for the ring dips and a purple one for the pull ups which was a disappointment to me as I am on a red band for non-strict pull ups, but with a hint of tendonitis and a desire for perfect form I pushed my ego down and did the focus as stated – for form. Without double unders and with a calf strain I’m still nursing (is there any part of me that isn’t injured?) I was clearly a candidate for bronze and that’s what I did. Barney cracked a joke about me being able to do that level twice and I laughed. Time = 5 minutes 51 seconds. Then Sol decided he was going again – he did gold the first time around. 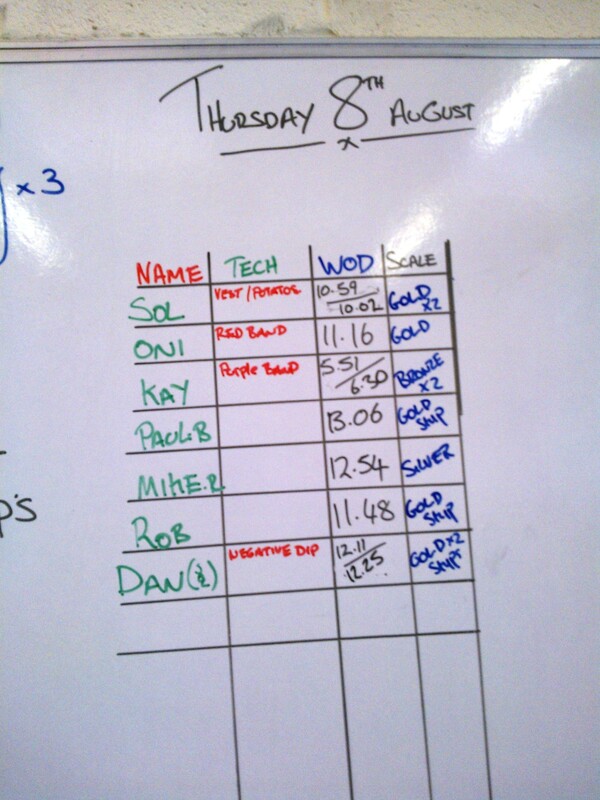 Dan kept him company and there was a rower free, so with Coach Barney’s encouragement I jumped on and did the WOD again. Time = 6 minutes 30 seconds. I was chuffed with my performance. The extra time in the second round was definitely down to the skipping, my ankles were fried after several hundred skips and quite a few attempts at double unders before we started the WOD, but I was happy to have the mental toughness to tackle the workout twice, even if my times dropped massively. Sol, being superhuman repeated the gold WOD even faster than the first time, then launched into a burpee penalty (my bad, I dropped him in it by mentioning it, I really was brain dead at that point) and swapping the burpees halfway through for an insanely fiendish press up game that Coach Barney challenged him to. Like I say, superhuman. The really big news is that our box is about to double! Not in size so much as in location – Unit 9, where we currently train, is about to be half of Crossfit Connect Hove – the other half will be in Unit 6 (which is not contiguous but you can’t have everything, can you?) and yes, everybody has remarked on the interesting way those numbers stack up. We’re going to have ropes to climb and everything! The little news is that my new brand new Shock Absorber crop top held up magnificently to the double WOD – I wasn’t confident that it would take the strain but it really was what they claim ‘dry and cool comfort’ – excellent stuff. I might even have to buy another! •	Wishlist – more of those crop tops! •	PB – only in terms of developing a functional fitness mentality. Still waiting to hear how Jon and Abi are getting on … hoping for good news from them soon! Posted in Crossfit, Crossfit clothing, pull ups, Rowing, Running, Why I do Crossfit, WOD and tagged double wod, Shock Absorber Crop Top. Bookmark the permalink. … is brought to you by Run To You (Bryan Adams) only partly because we’ve been having a facebook debate about playlists at our box and some brave soul is putting together a Canadian one. When you get to the box and Coach Barney begins the session by apologising you know it’s going to be an unpopular WOD. And so it was – today’s workout was simply a 5 kilometre run – for those that can run. ‘Was I going to row it?’ he asked. My response was non-verbal and non-positive. Fortunately, Sean turned up, so I knew I wouldn’t be rowing alone. Doubly fortunate, I’d put my sunglasses in my bag so I could row outside again without getting eyefuls of grit this time. Still, the prospect was considerably less than thrilling. 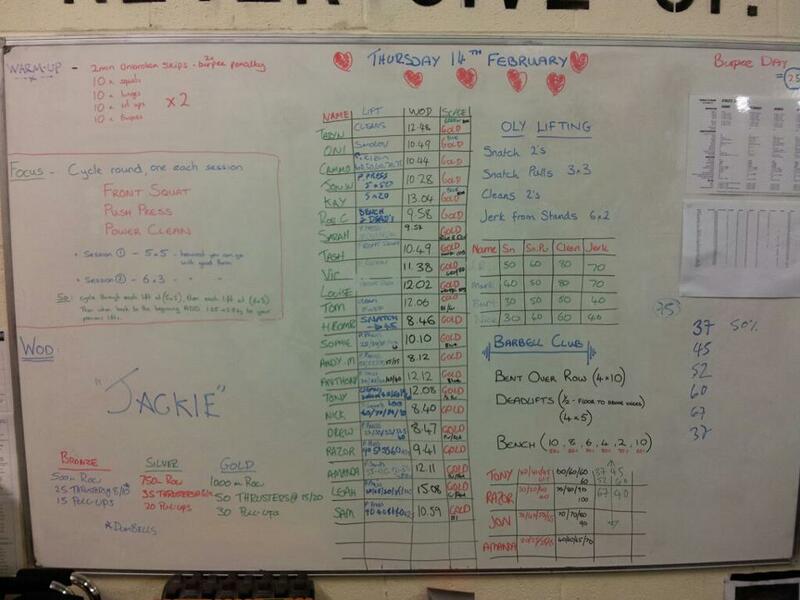 I pressed for the Wendler, and as I’m on the second week, got a max out of 17.5 kilos x 9 which is respectable for me. I think I’ll get a nice one rep max at the end of the cycle. By the time the runners were poring over the route map, I’d found out that Rob was rowing too. Both guys opted for an indoor row while I took my machine outside in the hope it might convince me that I was going somewhere. It was at this point, as the ten second timer was counting down, that I realised I had no water, no foam pad for the rower and Barney suggested – at the top of his voice – that I might enjoy listening to some Nina Simone. I used objectionable single-syllable language to reply. I was not thrilled at the idea of a 5k row and at 1.5k was feeling like I was going to hurl. Barney appeared beside me at that point and said, ‘Go to 2.5 kilometres so you get a time for your 5k’ and I grimaced at him and rowed on. No more foul language, although I can’t take credit for restraint, I just didn’t have any breath left. 2. Said sunglasses start to steam up pretty quickly and eventually it’s as if you’re rowing through a tropical sea fog – like a scene from Pirates of the Caribbean but with less Johnny Depp and squawking parrots and more Coach Barney yelling encouragement and van drivers from the next door unit passing comment on my performance – in truth there wasn’t much to choose between them and a parrot. Possibly the parrot would have had a better vocabulary. Then I hit my second wind. I’ve never had a second wind when rowing before. It was exciting. I rowed 95% from my legs, so bite me! If I’d had to row predominently with my arms, I’d never have made the distance – which I did, and I think I even had a negative split from the 2.5 kilo point. My time was 24:49 which I’m totally stoked about. I managed to finish the row before the last runner was back, which felt like an awesome achievement to me. I may pay for it tomorrow but I don’t care – it was like being one of the 300! Posted in Crossfit, crossfit exercises, crossfit problems, Crossfit women, Lifting, Rowing, WOD and tagged calf strain, crossfit, one rep max, Wendler. Bookmark the permalink. Well, it was for me. Everybody else got to run, except Sean, who’s injured too. Their WOD was 1 mile run – 3 minutes rest x 3. 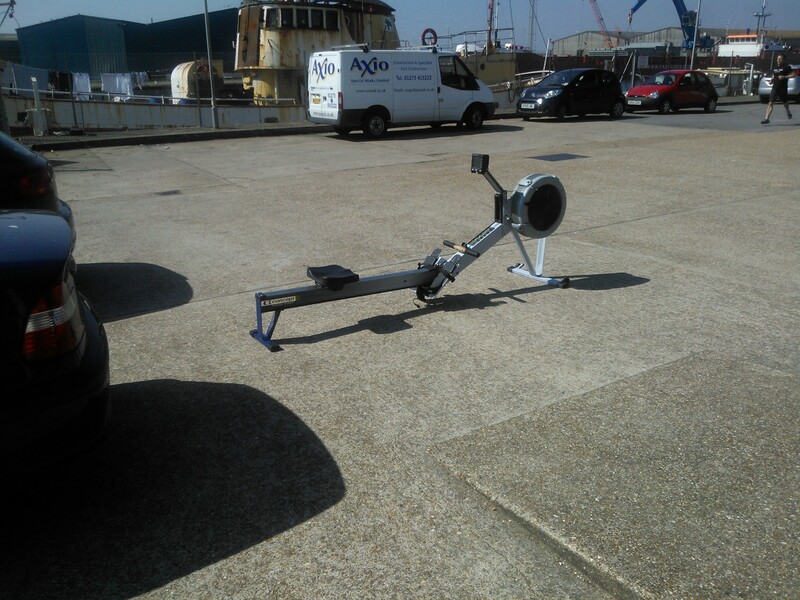 Sean’s was 1 mile row – 3 minutes rest x 3. Mine was 1 kilometre row – 3 minutes rest x 3. My times were 4.49, 4.45, 4.48. Or maybe you don’t. Maybe that’s just me. So I could tolerate being the dimmest bulb at the box if I was strong, or I could probably accept being a weakling, if I at least had swift perception and a meteoric learning curve, and I might be able to tolerate both slowness and weakness if I had immense mental fortitude and a great spirit. But the truth is I am a feeble, slow, wimp. I am not tough, I have no speed and my strength is derisory. So most of the time I leave the box feeling crap. 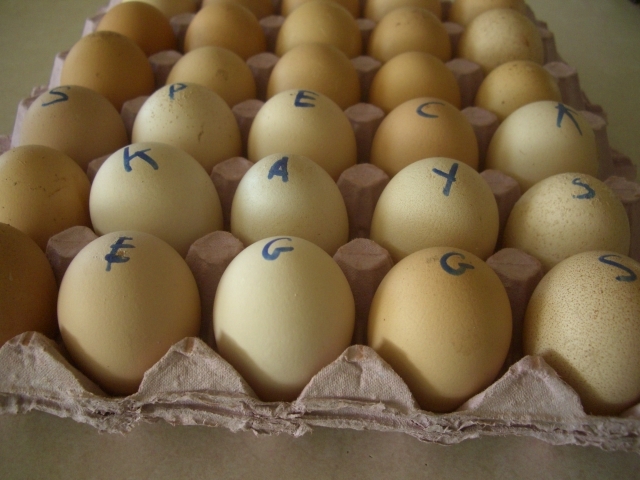 Also, there’s something peculiarly satisfying about going to the box with ramsons, purple sprouting broccoli and tarragon and coming home with eggs! Posted in Crossfit, Rowing, WOD and tagged calf strain, Wendler. Bookmark the permalink. Focus: handstands and bridges. It turns out that I can do a headstand against the wall okay, but not a handstand – I can’t understand what my body needs to do to kick up (why not, when I can do it from a headstand? Probably 30 plus years of yoga have created the headstand pattern) so that was fun (and wrist aching). Bridges, I can walk down the wall into a bridge but not push up into one (more wrist destruction). Clearly, if I am ever to make a Masters gymnast of myself I have yet more stuff to add into my daily practice. So … when I did this in August 2012 my time was 5:47. Today my time was … 6:18. Okay, I’m injured, so my rowing is not great – but I’m pretty sure it’s better than it was then. My squats are waaaay deeper than they were then, so they are probably a bit slower. Sit ups, about the same. Press ups – well I couldn’t do any then so I don’t know what I was counting as a press up, something floppy probably. Pull ups, I was on the green band. Some days just make you want to kick a hole in the fabric of space time and drag a spawn of Cthulhu through to do his thing. 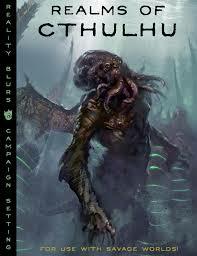 Posted in Crossfit, crossfit exercises, crossfit problems, Crossfit women, Rowing, WOD and tagged baseline fitness, cthulhu. Bookmark the permalink. Well, while it’s great to be able to wodding again, it’s also not great. 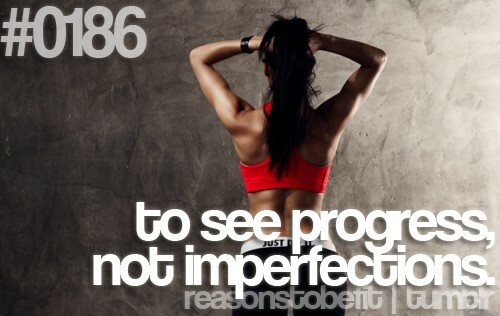 Struggling to see any progress. I don’t know how injury is for other people, but for me there’s always a tendency to get compensation (overcompensation?) injuries. As of today I’ve got the calf strain, then something weird going on with my shoulder tendons, probably because my pull ups have had to be a lot stricter now I can’t kick with my leg. And then my ITB/ piriformis started to hurt again. So it’s all a bit pear-shaped. Urgh. Not a great place to start from when considering the 06:30 WOD on a Monday morning. 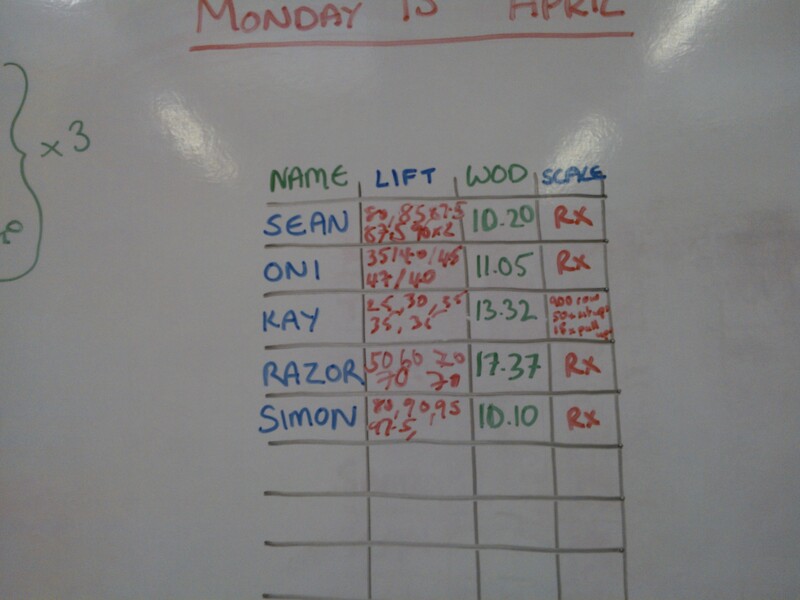 Still, it was nice to be there, and I managed to do 5×5 front squats – wide stance for me– and achieved 25, 30 and 35 kilos. 35k was where my leg started to have that weird feeling (like somebody popping bubble wrap inside the muscle) that is a warning sign to stop right there! So I stuck at 35k for the final three rounds. Given the amount of strict presses I’ve been doing in the past couple of weeks, even this felt like a major achievement. Actually, I just checked my 5 rep max and it’s 42.5k so maybe 35k with a calf injury isn’t so bad …? • 15 pull ups (purple band). So I knew I wasn’t going to run or skip, was happy with the air squats, but the kettlebell swings started to really pull on the calf muscle that’s injured, so Coach David subbed in pull ups for press ups, as I knew I was going to have a problem doing press ups with good form, given that you need to push back with the heels and lock the leg out to get a good line. Time 13:32 – kind of okay. Actually, that’s meh. A really meh time. Glad to be back wodding, really hope that I’m going to get back to proper training soon. 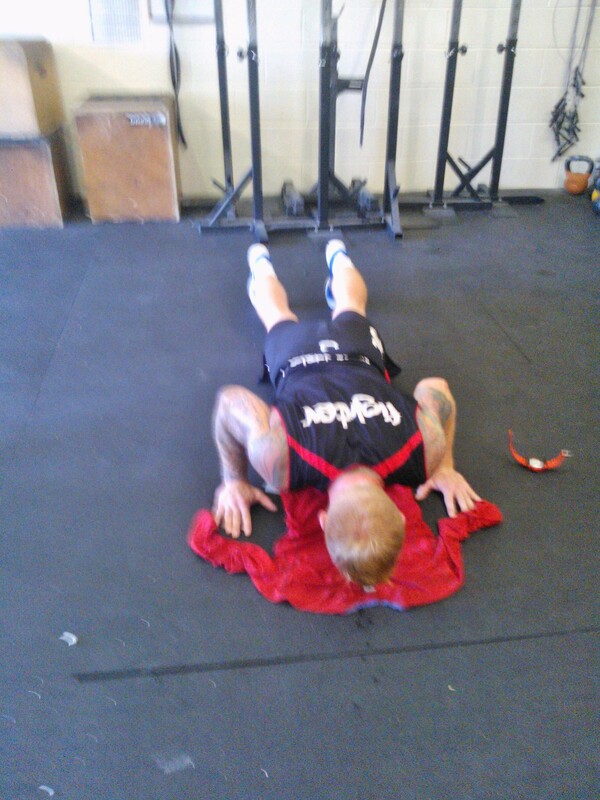 Posted in Crossfit, crossfit exercises, crossfit problems, pull ups, Rowing, WOD. Bookmark the permalink. I was worried about this, because I’ve been trying to understand a new rowing technique with a clear redirect from the full extension into the fold position, and having two lots of ‘instructions’ in my head can go badly wrong for me. In the event, it worked out fine and I rowed faster than the last time I tried a 1k, so I was happy. For the thrusters I took a 12 kilo bar – the Rx is 15 but I’d already wiped myself out on the push press so I knew there wasn’t going to be a lot going on with thrusters! I used a purple band for the pull-ups – I really don’t ever want to be back on the red one, but I suppose when Angie comes round again, I’ll probably have to add in the red. Overall I’m okay with my time of 13:04. The pull-ups after thrusters and push presses were really difficult, and I was more concerned to get my chin over the bar than about time. Not the most exciting WOD I’ve ever encountered but I suppose they can’t all be high drama or our hearts would never take the strain! Posted in benchmark girl wods, Lifting, pull ups, Rowing, WOD and tagged push press, thrusters. Bookmark the permalink.